Ecolodgistix offer the keen adventurer, horseback enthusiast and nature lover one of the most nature friendly and up-close means to explore Namibia. On horseback our guest are afforded up-close experiences among some of Namibia's best natural attractions. This is an adventure package that caters for the experienced, novice and family alike without compromising luxury and providing a true Namibian experience. Explore the oldest desert (Namib Desert) and contrasting beautiful Sossusvlei area, track Black Rhinos and meet Himba's at Grootberg (Kaokoland) or enjoy a sunset trail on the deserted beaches of the Namibian coast. 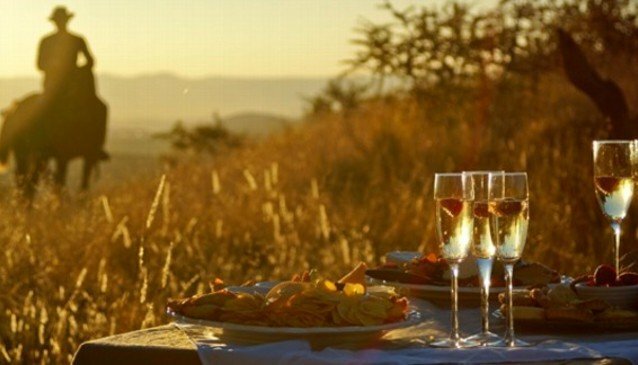 We offer a standard 10 day package that includes pristine areas like Sossusvlei, Swakopmund, Kaokoland and Windhoek. This offer includes all accommodations, meals, transfers and horseback activities. By incorporating our own lodges of Desert Homestead, Grootberg Lodge and River crossings we assure that you will be afforded the best in luxury. Our tours are guided by our own professional guides who are extremely experienced local professionals with ample of country knowledge and specialised in Horse Back trailing. We also offer the individual tailor made tours that can be itinerated to suit your needs, interest, budget and group sizes. For more information on tailored possibilities do not hesitate to contact us directly. For an in depth itinerary on our ten day package please find our tour description in PDF below.